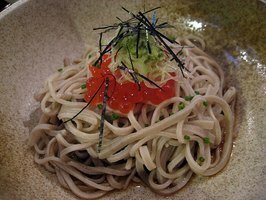 A cold soba noodle dish with salmon roe and daikon radish. Soba is a brown Japanese buckwheat noodle about the size of spaghetti. The noodles can be served cold with dipping sauces and toppings or hot in soups or broth. The buckwheat gives the noodles a nuttier texture and flavor than wheat noodles like udon, a thicker, wheat-based Japanese noodle. Like pasta, soba is available dried in traditional Japanese supermarkets, but taste best made fresh. It is a tradition in Japan to eat soba noodles on New Year's Eve. The long noodle represents a long and prosperous life. The basic ingredients in soba noodles are buckwheat flour and water. According to the University of Chicago's Celiac Disease Center, buckwheat contains no gluten and is safe to consume for people with celiac disease or gluten allergies. The color of the soba noodle comes from the unbleached ground buckwheat. Whole groat buckwheat is a good source of magnesium and manganese as well as containing lots of fiber and protein without any saturated fat or cholesterol. How are soba noodles made? Making soba noodles is very similar to making fresh pasta. Mixing the flour and water to form the dough is the most difficult part because the correct consistency of the dough is something that only a trained eye and hand can recognize. After the dough has come together, all of the air has to be pressed out before it can be rolled and cut. Rolling soba takes a long time and is done with a special Japanese rolling pin called a menbo until it has reached the right thickness. The soba dough is then folded over on itself and cut using a special knife into long, thin strips. The noodles are then dried for packaging or boiled to be cooked. How are soba noodles served? Dishes with soba noodles can be hot or cold. The most traditional form of soba noodle is called mori soba and is served chilled on a bamboo rack in a small box with soy sauce and wasabi for dipping. Zaru soba is similar to mori soba but it is served topped with thin nori strips. Hot soba dishes are mainly soups with a broth made from soy, mirin and bonito flakes and other Japanese ingredients like tofu, mushrooms or scallions. Soba noodles can vary depending on their ingredients and where they are from. Soba from different regions of Japan are named for that region. Soba flavored with other ingredients such as green tea or wild yams are named for that ingredient. And soba that contains small amounts of wheat flour (usually 1:5 wheat to buckwheat ratio) are named for that as well. 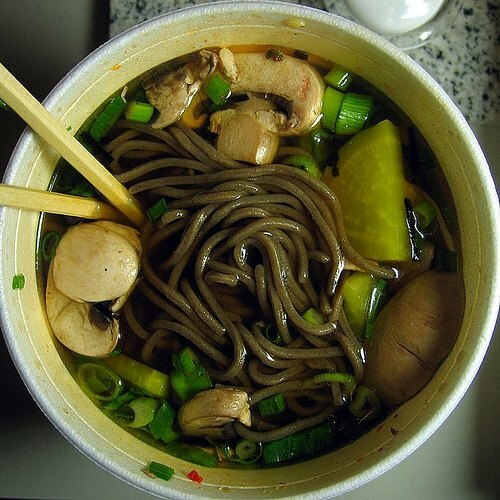 Soba noodles are lower in calories and carbohydrates than wheat pastas. The buckwheat content provides for slow-releasing carbohydrates will provide lots of energy over a long period of time. Soba noodles have a low glycemic index rating, meaning it will not cause your blood sugar to spike dramatically the way wheat pastas can. Photo Credit	A cold soba noodle dish with salmon roe and daikon radish.